Duck hunters plead guilty for illegal hunting practices in Loudon Co. 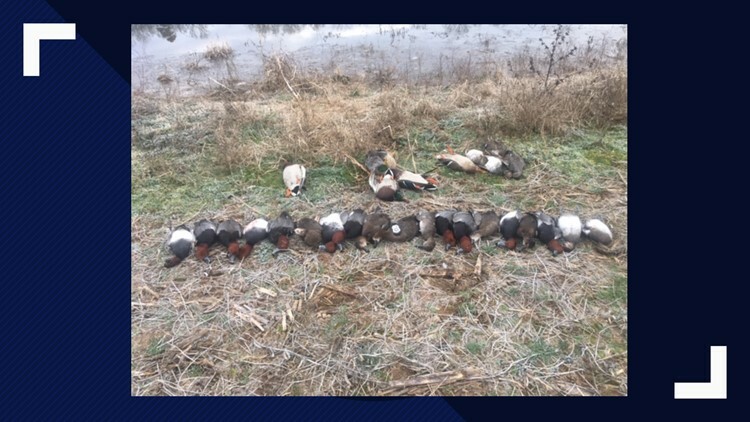 The three men faced multiple charges for illegal duck hunting, including exceeding daily bag limits and using lead shot. LOUDON COUNTY, Tenn — Three hunters charged with multiple violations associated with illegal duck hunting pleaded guilty in Loudon County General Sessions Court Wednesday, March 20, according to the Tennessee Wildlife Resources Agency. Loudon residents Stephen Giles, 50, and Justin Thompson, 30, as well as Phildephia resident Dalton Giles, 23, faced charges of hunting in a baited area, violation of the daily bag limit of redhead ducks (12 over the limit), violation of gross limit of waterfowl (5 over the limit), use of lead shot, hunting without proper waterfowl license and violation of federal duck stamp, according to TWRA. On Jan. 26, wildlife officers cited the men who were hunting a farm pond baited with corn in Loudon County in the area of Highway 72 and Watkins Rd. TWRA said All three defendants pleaded guilty on all charges and were ordered to pay fines and court costs totaling $5,140, lost their hunting privileges for one year and forfeited three shotguns.